Checked the weather lately? I knew the 70-degree goodness wasn’t going to last long! It’s supposed to rain from now (Wednesday night) until Monday evening. That’s a lot of rain. And a lot of unpleasant trips outside with the pup, which always turn into a wet-dog smell all over the house. Gross. You know what makes all of this OK? We’ve made lamb stew. And we have leftovers…which we plan to eat almost constantly in hopes that its warm, comforting aromas and flavors will carry us through this nasty weather. 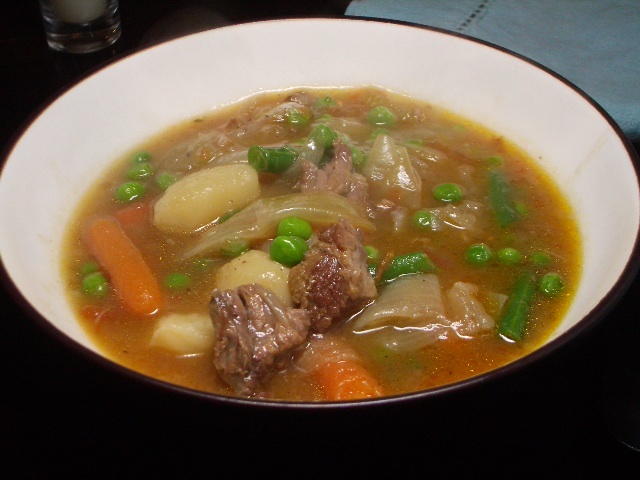 We suggest you make some stew, too… and then cuddle up with your wet dog and enjoy. Oh, and you can thank Julia Child for this particular stew recipe. Her actual (much fancier) title for the recipe is Lamb Navarin Printanier (or, for those of us who took Spanish in high school, Lamb Stew with Spring Vegetables). We’re hoping the “spring vegetables” part of the recipe is a sign of good, spring-y weather on the horizon. Mmm, I love the little peas floating in your soup. A great dish to warm you up! looks yummy and I can just smell it now!